“We cherish too, the Poppy red that grows on fields were valor led, It seems to signal to the skies that blood of heroes never dies.” This Memorial Day themed poem was written by Moina Michael in 1915 in honor of those who died in the Civil War. Her idea sprouted from the poem “In Flanders Fields” by Lieutenant-Colonel John McCrae that spoke of poppies growing on war-troubled lands. Moina started wearing a poppy flower on her jacket and sold them to her friends and co-workers, with the proceeds going to help servicemen in need. Once this tradition started becoming more popular, Madam Guerin from France learned of this custom and brought it back with her to raise money for war orphaned children and widowed women. In 1922, the Veterans of Foreign Wars (V.F.W. ), became the first organization to nationally sell these poppies. The Memorial Poppies became a worldwide symbol for remembering those who lost their lives in battle as well as a hope for new life after war. 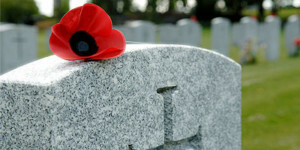 This weekend, if you can, wear a poppy flower to remember all those who lost their lives for our freedom.